Well well-November you have been good, but it's December I'm really looking forward to. Aside from the excitement of the festive season, there's also a mini-break, concerts, parties and Blogcademy to look forward to. Before I get a bit ahead of myself though, here's a look back at some of the posts that have gone live on Nana Wintour over the month. 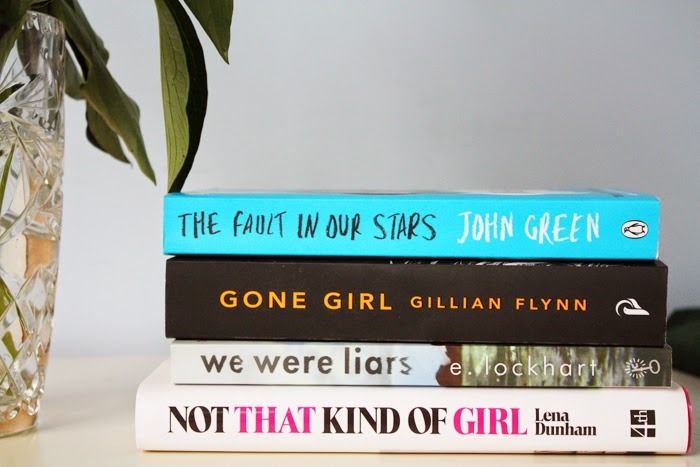 It's been quite a busy month in terms of posts and videos as you will see..
Best of 2014 #1: The Books-I've really thrown myself back into reading this year, particularly after discovering Goodreads and Sanne's channel. It was actually really hard to narrow all the books I've read down to a mere ten but somehow I did it. Note this is part #1 of a series. I have makeup and miscellaneous beauty things to come yet. Miscellaneous Christmas Gift Ideas+Wrapping Essentials-Christmas began in November and I have no regrets about that. This post included some gifts I think would be great to receive for the non-beauty fan or if you don't want to buy somebody makeup. 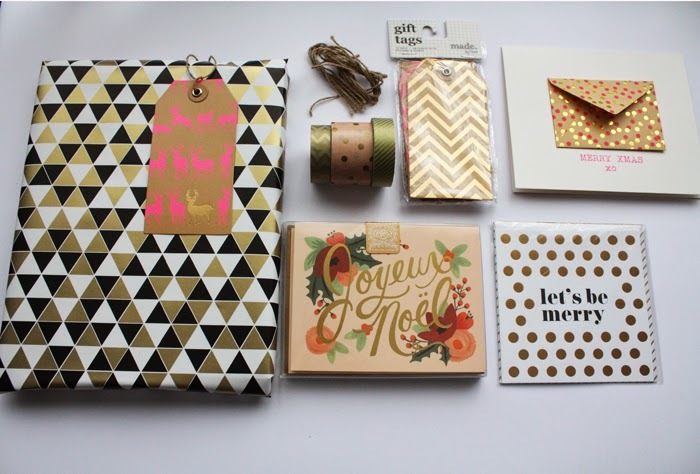 There's also some of my favourite cards and wrapping options in there too for good measure. Pro tip: Typo and Kikki K have you covered. Mrs Pinto x Amber Whitecliffe-The lovely Amber invited me along to preview her new collection that was showcased earlier in the year at NZFW. It is beautiful, vibrant and fun. Her shop is gorgeous too so definitely check it out if you're in the area. I may just have to go back to get a Christmas frock..
Zoella Beauty-Zoe is one of my all-time favourite bloggers/vloggers so when she debuted her new line of bath and body products I had to get my hands on some. If you pick up one thing from this range I'd go for the body lotion, or the fizz bar, or the makeup bag. They're all great really! That makeup bag is seriously roomy too. 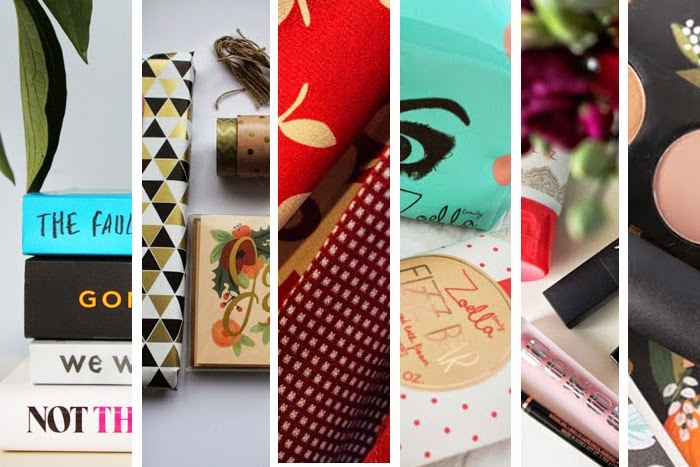 November Favourites-There were so many gems in November's favourites selection and I can see many of these products making their way into my yearly favourites later on as well. From a product I wish had joined the ranks sooner, to the cd that got me in karaoke mode, there's something for everyone in here. New from Mac-Ahh Mac. I feel like I've really been ignoring my faithful Mac products recently which is just not right. These new products have been welcome additions to my palette though. Their Christmas collections have been taking my fancy actually. Ruby Woo, here's looking at you. I'm also eyeing up the highly-coveted Soar lipliner too thanks to Kylie J so no doubt you'll be seeing more from them soon. Peony Lovin'-Peonies are some of those flowers I've always dreamed of owning so when I spotted them in a florist at one of our local shopping centres I may have shrieked excitedly. This bunch came home with me and they're still going strong. Pro tip: They love to have ice in their water and that seems to make them last longer. They also smell heavenly too and just look how beautiful they are. Love. 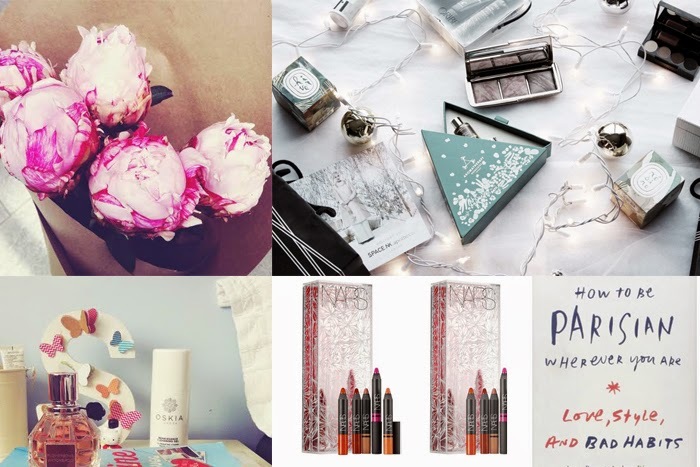 The Christmas Gift Guide for Beauty Lovers-Gift guides are in full swing at the moment and dare I say it, I kinda wish I hadn't been so organised with Christmas shopping this year because each day it seems I see something and think "that would've been such a good gift for *insert friend/family/cat here*. Anyway, if you have a beauty lover to shop for then you need to check out Tamira's gift guide in collaboration with Space NK. There's some real gems in there for a range of price points+interests so definitely go give it a watch. Flowerbomb-We've probably all spotted this Viktor & Rolf fragrance on perfume counters at some point. This grenade shaped bottle is just so striking.Well I was lucky enough to actually win this from the lovely folk at Mighty Ape who were involved with a recent #nzbloggers chat. It's amazing, and I know it's going to become a staple in my perfume collection. A Lip Set You'll Love-This year has really been the year of the lip crayon and Nars' Velvet Matte pencils still remain my favourites. Pigmented, long-lasting and not too dehydrating on the lips. They're stunners. If you're feeling spendy then you may like this Digital World Lip Coffret. It contains three satin pencils and two mattes. They're all more on the bold side of things but they're gorgeous. You could even buy a set like this and split the set up to give these to a friend. Live Like A Parisian Woman-I was lucky enough to go to Paris four years ago and I was absolutely enchanted by the city. The fashion, the way Parisian women carry themselves, seeing people reading in Paris' busiest parks. There's just something about it. Anyway, this book was recently released and I loved it. Yes it's a guide of sorts but the book doesn't take itself too seriously. I was laughing out loud at some parts. Also, the Parisian's emergency handbag guide is spot on. *Have the best weekend peeps! I feel like this week has been so busy with blog things+general life craziness. I'm going away for a bit at Christmas time so I'm trying to get everything done before I leave so that I can have a bit of time off. This weekend I'll be getting excited for Christmas. An Elf screening may have to happen and I'll be thinking about Blogcademy which is next weekend! I am so excited for that. Have an amazing weekend everyone x. Two videos in one week?! Aren't you all lucky things. I've made the hard decision and whittled down all the books I've read this year to a mere ten. 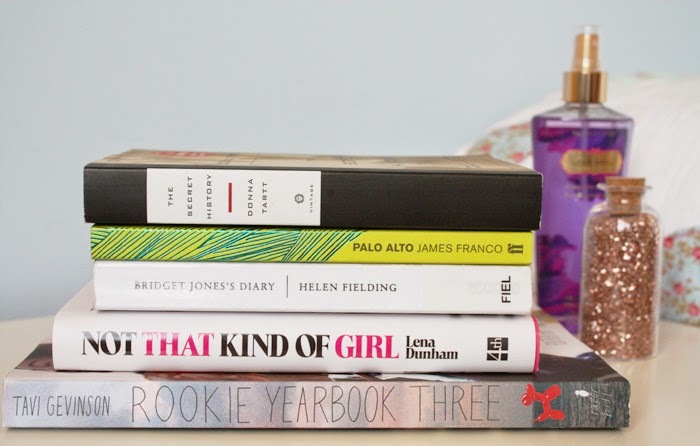 There's fiction, a few memoirs and some home-inspiration. All the things I love in books. Some of these probably won't be a surprise if you're following me on Instagram or Goodreads but maybe you'll find some new material to add to your wishlist of books. Enjoy! Now this cleansing gel promises a lot of things. It says it is suitable for a variety of skin types, is loaded with a heap of nutrients and is paraben free. It may not be 100 per cent organic but it's packed with enough skin-loving ingredients that I wasn't overly bothered about that. Now this is described as a cleansing gel, which is a tad misleading. Once massaged into the skin it becomes more of an oil without the thick, greasy texture. This is so lightweight and it doesn't feel heavy on the skin at all which is something I like having combination skin. Side note: I feel like my skin's more on the normal side of things these days. I only really get oily down my nose (sigh) and the odd blemish. In terms of makeup removal I tend to use a micellar water first and then follow up with this to get my face makeup off and it does remove anything I may have missed. It also leaves my skin feeling ridiculously clean and super smooth. It's love. 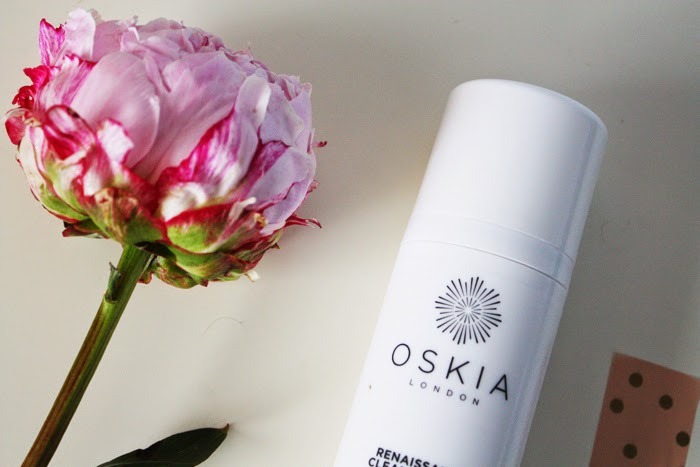 While this cleanser may not be the easiest for us to track down in New Zealand, hence making a blind-buy a little bit of a risk, I'd highly recommend this offering from Oskia. It hasn't irritated my skin and I love it. I feel like this big bottle is going to last me a while too which is always a bonus. -Have you tried the Oskia Renaissance Cleansing Gel? What did you think of it? *I hope you are all having a brilliant start to the week. Yesterday I did a spot of Christmas shopping with Mum. I wasn't tooo spendy seeing as I kinda got that out of the way on the weekend. Whoops. 'Nuff said. Today's looking a bit low key but I'm sure I'll be daydreaming about iceskating with Harry Styles at some point. The month may not quite be over but I was pretty dead set on what was going to make its way into the favourites lineup early on this month. 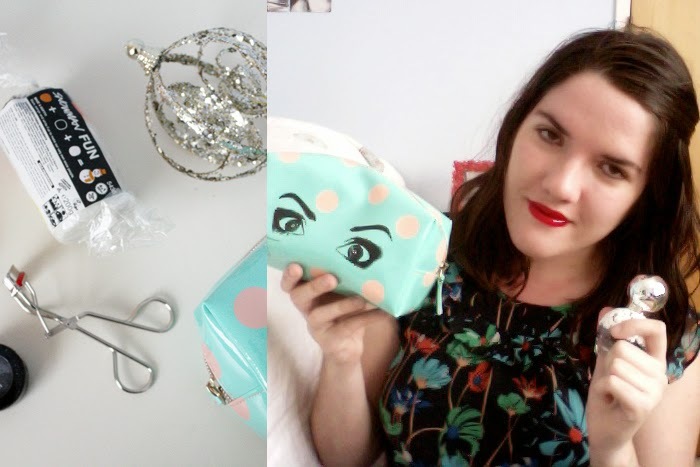 There's some beauty staples, a few Sephora bits and even a couple of non-beauty favourites in there. You'll also get to hear me say "I like it/love it" more times than I can count and even see a little lip-syncing interlude. Enjoy, and be sure to let me know what you've loved throughout November in the comments. We are infinite-Sometimes I do things on a whim like spend an hour browsing the Auckland City Library. Aside from a ridiculously brilliant selection of books they also have a ton of CD's and sheet music. I hired The Perks of Being a Wallflower soundtrack and it didn't disappoint. Fans of the movie should know that though. My favourite track so far is Heroes or the 'tunnel song' as it's better known. Barbarella-My friend and I made a little order through Beauty.com recently and I added this Nars lipstick to my basket. It looks scary orange in that picture but because it's more on the sheer side it doesn't look too orange on. I'd say it's more of a peachy pink with the subtlest hint of orange. It's just beautiful. It wears really well too and doesn't feel drying. My new favourite bookshop-We used to have a lot of really great bookstores in NZ but many of them have since disappeared. Thankfully some of the best independent bookstores still exist and one of my favourites at the moment is Time Out in Mt Eden. It's not the biggest of stores but they pack a hefty amount of books into their little shop. They have a bit of everything, and there's even a shop cat who makes appearances from time to time. If you're in Auckland it's well worth the visit. Man Repeller and Iris Apfel-Leandra Medine and Iris Apfel, two of my favourite fashionable women got together recently and aside from an adorable photoshoot, they also filmed a video and my corner of the internet exploded. They both have such a brilliant approach to fashion. Snow in Summer-Fun fact. I have never seen Snow in real life. Ever. Do I feel deprived? Not really. Okay, maybe just a tad. Maybe I can "fake it 'til I make it" with this Instant White Snow from Kikki K. It looks awesome! I was playing with it at the counter in store the other day, because I act like an adult when I'm alone *ahem*. If you too haven't seen Snow then maybe you should pick some up for yourself this weekend. I joined Pinterest back when it was invite-only and ever since I have been hooked. My tastes in decor and fashion may have changed drastically since those days, but it is still my favourite online destination to seek out inspiration and ideas for everything really. Anyway, I thought I'd share some of my favourite images I've found over on Pinterest lately. If you want to follow my boards you can do so here. Metallics-If you follow my home-centred boards you're going to notice copper, rose-gold pieces appearing an awful lot. There is also a lot of white and minimalistic settings. A container like this would be perfect for your makeup brushes, skincare, stationery...the possibilities are endless. Lipsticks-My name is Sophie and I'm a lip product addict. That's all. Smoking Slippers-These are such gorgeous shoes! I used to have a pair of gold loafers similar to these but I think this pair are so much more fun. Simplicity-Another simple room setup. Look at those big window spaces too! Perfect for reading in the sun. Pearls-I used to be all about the crazy jewellery but in recent years I seem to have really toned that down. These giant pearl accessories are a trend I could get behind though. Those rings look gorgeous. Zoe & Morgan Earrings-These would be so gorgeous for Christmas but when are stars not gorgeous? I think these would be perfect in silver as well. 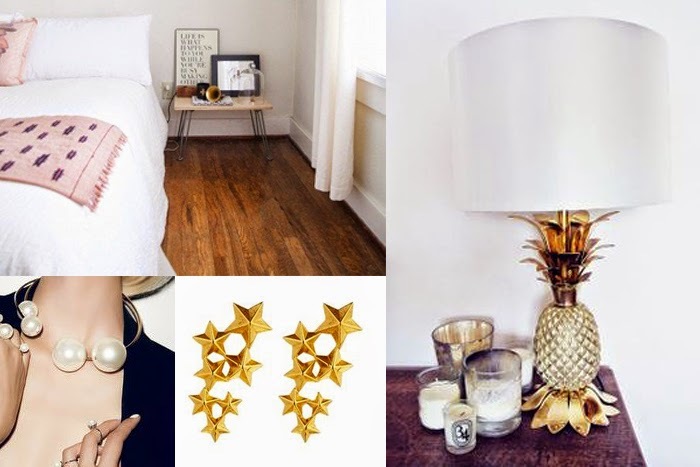 Pineapple Lamp-Dearest gold pineapple lamp. Please feel free to join my life+room. We'd all get on splendidly. I believe Laura Ashley have something similar to this if you're in NZ. This would add a unique touch to any room it is placed in. *Hasn't this week gone fast!? Maybe it's just me. I've been busy with blog stuff, paperwork and the continual job+intern search. Thrilling stuff! Today I'm off to run some errands in town and hopefully take some photos. I'm planning to share another visual diary soon. I also have a tropical themed dinner to go to. I'm supposed to find something colourful to wear amongst my monochrome wardrobe. Yeeeah that's not gonna happen. I hope your weeks are going fab x. A Very She & Him Christmas-Christmas albums are something you'll either love or loathe. The Mariah album is not for me but come Christmas time, Love Actually's soundtrack and this classic from Zooey Deschanel and M. Ward come out to play. It's definitely one for those with more indie-geared music taste but it's a lot less painful to listen to than some of the cringe-worthy compilations out there. Rookie Yearbook 3-This is the best of Rookie online in book form with loads of extra interviews and stories that aren't online to keep fans happy. If you're like me you might drift in and out of Rookie but it's always a site I come back to. This would be great for a teenage girl, Tavi fangirls or just anyone who loves darn good content. 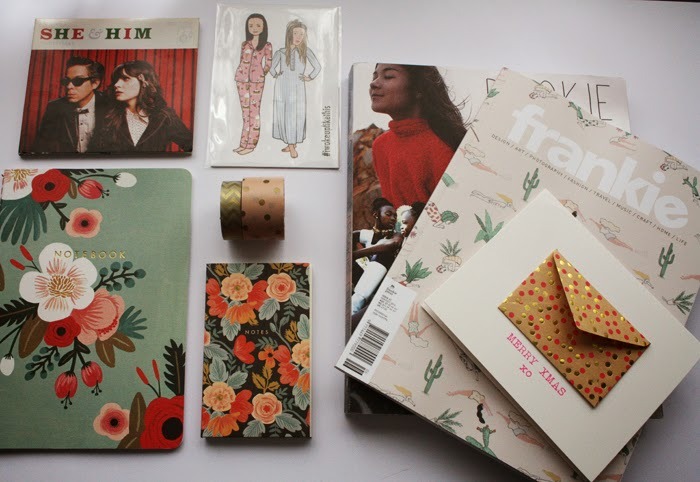 Rifle Paper Co Stationery-Look how gorgeous these notebooks are. Now think how good they'd look in whoever's hands you choose to deposit them into. Rifle Paper stationery is all beautifully designed and presented. They've also got a range of prints, calendars, recipe cards and even children's books to choose from in their online store. Shipping to NZ can be a bit pricey but it all arrives in perfect condition and really quickly so it's worthwhile. Music & Book Vouchers-Let's be real, some people are just hard to shop for and if you know they're music or book enthusiasts then vouchers can often be the way to go. They can choose what they want themselves and everyone wins. iTunes gift cards are always bound to go down a treat and can be used across Apple's extensive iTunes store. In terms of book vouchers if you're based in Auckland I'd suggest heading to Unity Books or Time Out Books. They have fantastic ranges in store and whoever you're shopping for won't walk out empty handed. Magazine Subscriptions-I already know that I'm getting a Frankie magazine subscription for Christmas and I'm not gonna lie, I'm really excited about it. Subscriptions are one of those things I don't tend to buy for myself so when I'm gifted one it's the best. Magazines I'm loving at the moment and think are worth subscribing to are; Frankie, Kinfolk, Nylon, Yen and Donna Hay if you have a foodie to shop for. 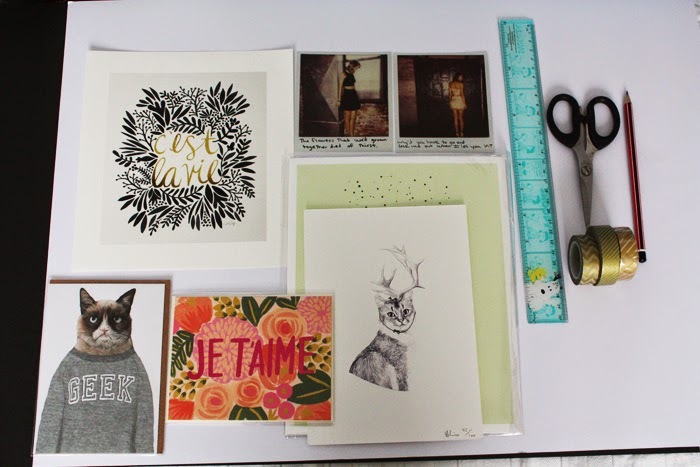 Etsy Prints-Or anything from Etsy really! They're a great destination to shop for unique gifts and are perfect for pop culture fans. 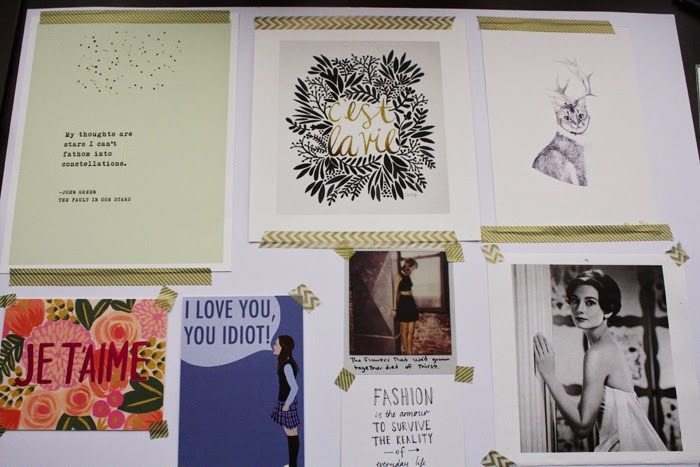 Above are some Gilmore Girls cards I featured in yesterday's post. Simply think of any movie or film star (for example) that you or your gift recipient love and you'll be rewarded with a range of gems. Kikki K 'Merry Christmas' Card-This is giving me Kate Spade vibes and those dots. Beautiful! I believe you can buy these cards in sets too if you're wanting to share them around. 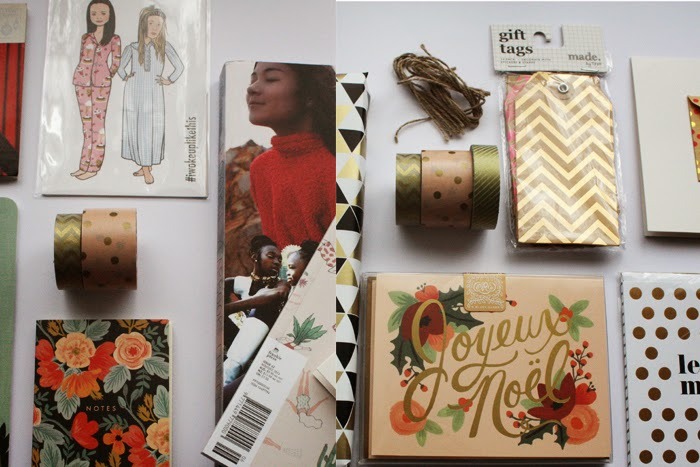 Rifle Paper Co Joyeux Noel Cards-I think the visual above does all the talking for these really. I'm going to be giving these out to some of my rad friends and blogging pals and hope they love them as much as I do. Typo Gift Wrap-Gees Typo, you could've been a bit more inventive with your names..Surprise surprise, more gold. I initially bought this paper to wrap up some bits'n pieces from a swap I just did but the rest is going to go towards Christmas presents. I'm not a fan of paper that looks too Christmassy, so this paper with subtle gold accents and motifs appealed to me. Typo 'Give It To Me' Tags-Now gift tags are by no means an essential but they add a nice little touch. You can attach them to some twine or ribbon if you're feeling creative as well. Typo Christmas Card-I'm pretty sure this card came home with me because of the mini envelope factor and of course the gold+dot detailing. I think this is such a cute card and if I wasn't planning on adding it to my Christmas moodboard it'd definitely be making its way into someone's letterbox. *What's on your wishlist for Christmas? *An A3 sheet of black card or paper. 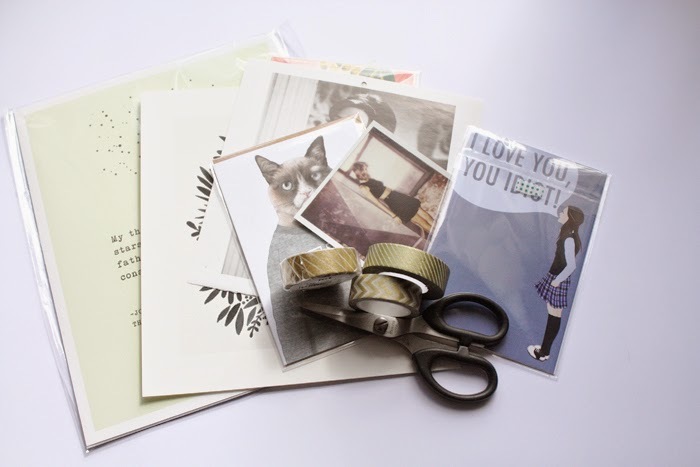 *An assortment of prints, cards and photos. *Washi Tape. I've got quite the problem obsession with gold washi tape at the moment so that's what I chose for my wall. *Select your items for your wall gallery. I opted for a selection of prints, cards, Taylor Swift Polaroids and an Audrey Hepburn photo which was in an old calendar. I'll link these prints and things below x. *Lay the images out on your black card and play around with how you want them arranged. I had a variety of different sizes so I played around with the order to mix it up. I also had a few quotes and phrases so I tried to separate those so the text wasn't all in one corner. *Once you've settled on an order you can then trace around the images on the black card, label them and then cut the black card out. Now I didn't do this but you can label each print on the black card and then move them around on your wall to see how the layout will look. *Grab your Washi tape and get sticking! I opted for a gold chevron tape and then a gold striped one but if you want something that isn't patterned you could just use plain coloured Washi tape instead. I chose to do some with just tape in the corners and then used longer strips on the larger prints. It's entirely up to you what you do here. This is just what I liked. Voila! Let me know if you enjoyed this DIY. *What would be on your DIY wall? *The Fault In Our Stars Typography Poster, Etsy. *Je T'aime Card, Rifle Paper Co.
*C'est La Vie Print, Society 6. *Taylor Swift Polaroid, part of the 1989 Deluxe Edition. *Bill Cunningham Quote, from a set of fashion cards at Kikki K a couple of years back. *Audrey Hepburn photo from an old calendar. They usually include this in most Audrey calendars when they're released so you're bound to find it in there or any Audrey photo books. 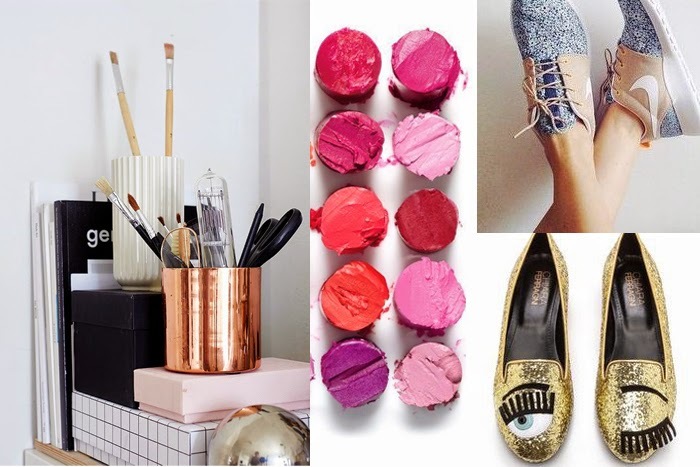 Beauty Editors' Favourite Things-Beauty editors get sent a lot of stuff so naturally it takes a product a good deal of work to win them over. 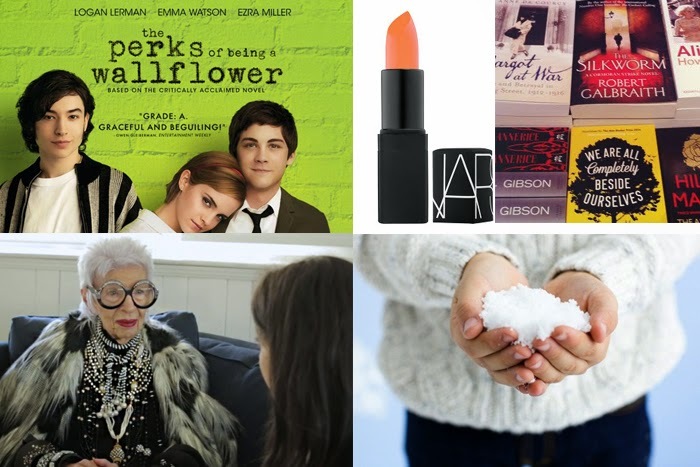 The Coveteur published their findings on what some of America's top beauty editors love. I'm adding Kevyn Aucoin mascara to my wishlist after seeing multiple raves for it. 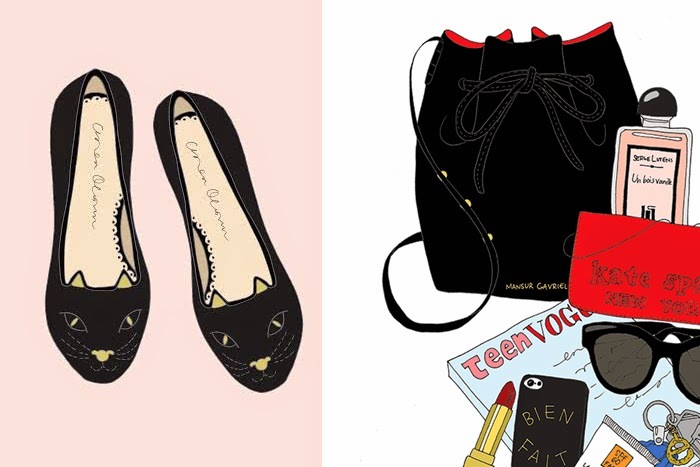 Garance Dore + Rifle Paper Co-There's just something about fashion illustration that seems to get me every time. The Garance Dore + Rifle Paper Co collaboration is no exception as I've got one of their to-do list notepads in my life. Well they've added some new bits 'n bobs to the range. I love these notebooks. For the beauty-obsessed, they have some products adorned with makeup illustrations too. I'm obsessed basically. A British Reading List-Now I thought my reading list growing up had been heavily influenced by British literature. Apparently, I was wrong because there was maybe one or two books in Sanne and Liv's video that I had read. I added several books from this video to my Goodreads feed and top of the list is I Capture The Castle. If you're bookishly inclined I suggest you give it a watch. 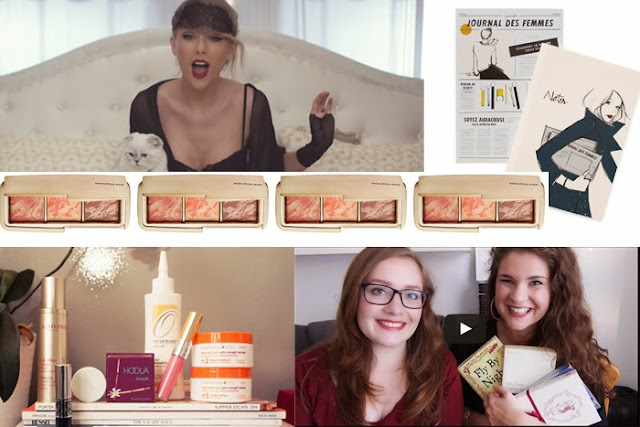 Taylor Swift Meets Gone Girl-Or as my friend so aptly put it, Tay Tay goes cray cray. This is such an awesome video though. Aside from the Gone Girl vibes there's eye candy, cats, a tonne of costume changes and red lips. Taylor's killin' it in the best possible way. Matchmaster Concealer*-Stick concealers, or the idea of them at least have always scared me. I've seen reviews of a drugstore offering and not been impressed but once I got to grips with this Mac one I was set. It has been designed to sit alongside their Matchmaster Foundation and I was sent the shades 2 and 3. Funnily enough 3 is actually lighter than 2. Anyway, I found the best way to apply this was to take a small amount on your finger and then either pat it in with fingers or a beauty sponge. As it is on the thicker side you need the tiniest amount. I'm saving this concealer for days when the redness or blemishes are going a bit wild but my first foray into stick concealers hasn't disappointed. Soba Eyeshadow-This is one of those Mac colours that doesn't seem to get a lot of love (it's the one on the left btw) and I'll be honest it does look a bit 'meh' until you put it on your eyes. There's just something about Soba. It's described as a gold brown with gold shimmer but it's not overly gold or yellow toned so to me it's a lot more wearable. For reference, most metallic gold shadows make me look like I've stepped out of the Capitol in The Hunger Games. It's just beautiful and this photo really won't do it justice so go to a Mac counter and swatch it or try it on yourself. Wedge Eyeshadow-I purchased this at the same time as Soba with a birthday voucher as I wanted another matte shadow to use as a crease colour. This was one I've seen Tanya mention countless times in her tutorials so it had been on my radar. It's a light brown and just looks a lot softer than the crease colour I had been using. On lazy makeup days I just apply this all over the lids for something simple on the eyes without the major effort involved. 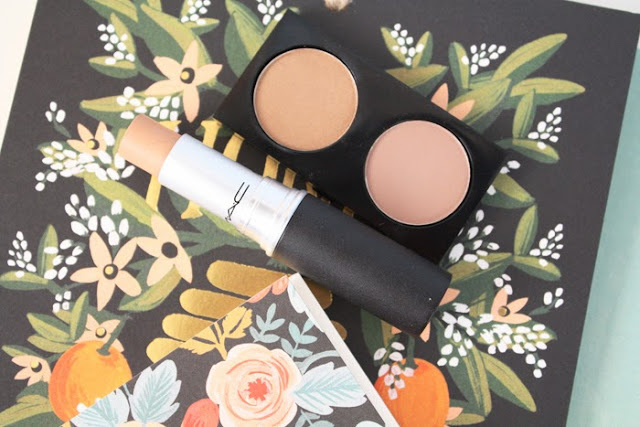 *Have you picked up any new products from Mac recently? Recently I've been picking up books that I've always wanted to read and some whose release dates have been eagerly anticipated. It's quite the lineup really. Anyway, here's a look at what I've read/am currently reading. If you ever want to follow what I'm reading you can over on Goodreads. Not That Kind of Girl by Lena Dunham-I'll be honest, I'm still yet to watch a single episode of Girls but Lena Dunham is someone I admire. And I count myself a fan...This book is more of a series of essays about events and moments in Lena's life. The book is divided up into sections like body, friendship, work and so on. It's hilarious and inspiring. Lena is awesome. End of discussion. Palo Alto by James Franco-Palo Alto is a series of short stories about "teenage alienation in Suburban America". If you liked The Perks of Being a Wallflower you'd probably enjoy these stories as well. They can be a bit hard hitting at times but I didn't mind that. It'd be interesting to see how this compares to the film because none of the stories really intertwine, they're all very separate. Rookie Yearbook 3 by Tavi Gevinson-Now I'm yet to read this properly, it did only arrive yesterday but a quick flick-through did happen. I've read the previous two yearbooks and this one perhaps may just be my favourite of the lot. Aside from features with Ella aka Lorde, Dakota+Elle Fanning and a lot of other awesome, inspirational women there's some photo essays from Eleanor Hardwick, diary entries from Rookie contributors and more to keep us entertained. Bridget Jones' Diary by Helen Fielding-So I am a little late to the ol' Jones bandwagon but this was hilarious. I had to stop myself laughing out loud many a time on the train. It's easy to see why so many women could see traces of Bridget in themselves, myself included. The sequel was excellent as well but the third book was a bit disappointing. It is possible to have too much of a good thing sometimes. Anyway, if you've not read the book that started it all you should because it's brilliant. The Secret History by Donna Tartt-Someone I admire/fangirl over mentioned this book somewhere. It may have been Lorde or Tavi, I don't remember. Anyway, in a bit of an impulsive moment I decided to pick this up and have been slowly making my way through it. The book follows a group of Classics students at a New England university. They're quirky and intellectual but all is not as it seems. You find out at the beginning what major plot twist occurs and the book then takes you back through the events leading up to it. I'm still not finished this book but I will keep you posted once I have because it seems like a lot more is going to happen yet. *Have you read any of these books? What did you think of them? It's now November and that now gives me a justifiable excuse to start talking about Christmas. As you can see above I even felt the need to dress for the occasion. I've filmed a video of some of my picks for Christmas from the beauty world. There's something for a range of budgets so hopefully it'll please you all. If you want to see reviews of anything in this video please let me know. I've linked anything that's already been blogged in the description box. Enjoy! A Picture Speaks A Thousand Words-Oh my gosh cliche alert, sue me blogging police...If you follow the Humans of New York page on Facebook though you'd probably have to agree with that expression. Now I was going to show you this book in a video but I stupidly took it back to the library early. Whoops. Anyway, Humans of New York the book is really special. You'll feel all the feels and I loved seeing everyone featured's portraits and the stories alongside those photos. There may have been some crying at some point over said stories... It's such a feel-good kind of book that'd make the perfect Christmas gift for someone who's a bit tricky to buy for. Taking A Walk On The Matte Side-My 19 year-old self probably told people that matte shades were "totes ugly" or something equally as eloquent. Flash forward a few years and I can now appreciate the power of a good matte eyeshadow. One of my lovely friends bought this back for me from her travels and while it's early days I am very impressed. I rarely wear eyeshadow without primer but the first time I used this I did and they lasted so well. Don't be surprised if this ends up in my November Favourites. 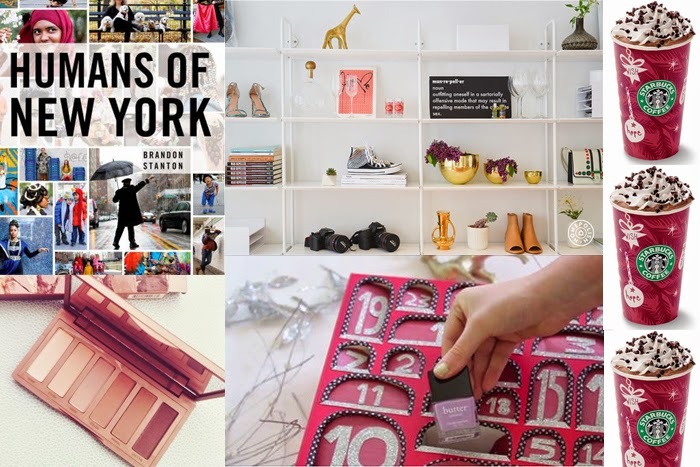 BRB Moving To New York-Wouldn't that just be the dream situation? No stressful Green Card/Visa process just pack a suitcase and bam, you're in New York, in the Man Repeller Offices. I literally don't know what to say about this other than I think this space and its contents are perfection. Starbucks+Christmas=LOVE-I figured out earlier that every year of this lil' blog's existence has featured some sort of mention of Starbucks Christmas Drinks. You'd think I'm Lorelai 2.0 or something. Well, this year Starbucks are spoiling us emptying our wallets with their Peppermint Mocha flavours. My friend Jess has mentioned it so when I saw them in Starbucks the other day I had to try it for myself. The frappe version was amazing. I'll no doubt be trying the hot version of this sometime soon as well. Advent Calendars With A Twist-Beauty Advent Calendars seem to be all the rage at the moment but they sadly seem to come with a hefty price tag. The Jo Malone one launched in the UK for a whopping 250 pounds (500 NZD basically). Insane! Well Tara and Ellen have found a way around this little dilemma if you're not feeling so spendy and have made their own advent calendars. You can fill it whatever you please, beauty, chocolate. It doesn't even have to be expensive. If you're feeling creative you can check it out here. 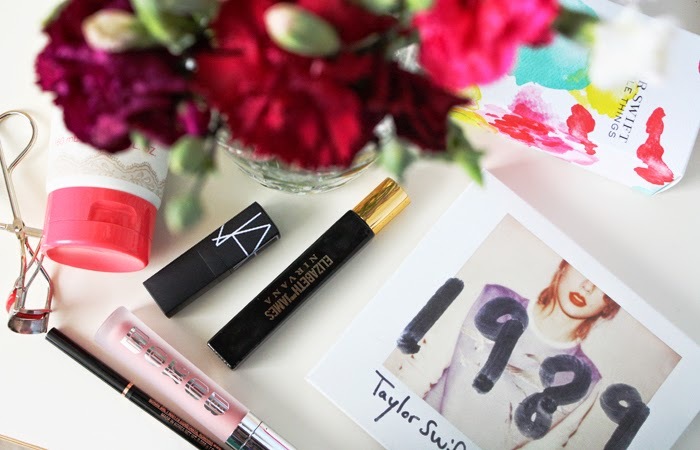 PS-Don't forget to enter my giveaway if you haven't already! 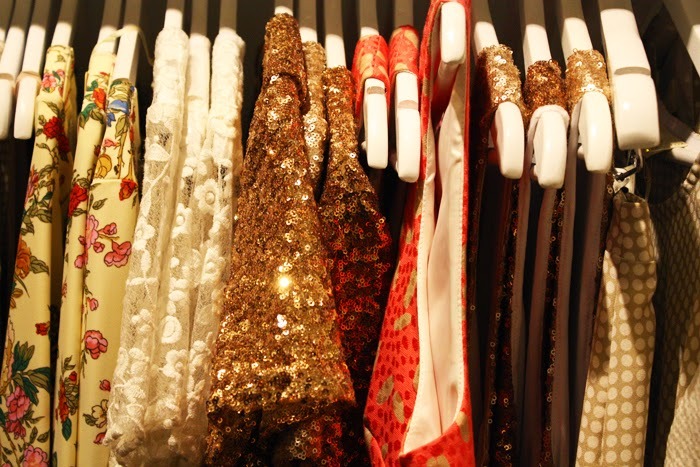 In an ever-continuing quest to bring some fashiony-bits back to NW, I headed along to a blogger's preview night for Amber Whitecliffe's new collection at her Parnell flagship store. Fun fact: Amber Whitecliffe used to blog herself over on Amber and Hillary which is sadly no more. On the plus side, she's now bringing us a tonne of gorgeous, locally-made fashion pieces. Her latest collection Mrs Pinto debuted at New Zealand Fashion Week and it is stunning. 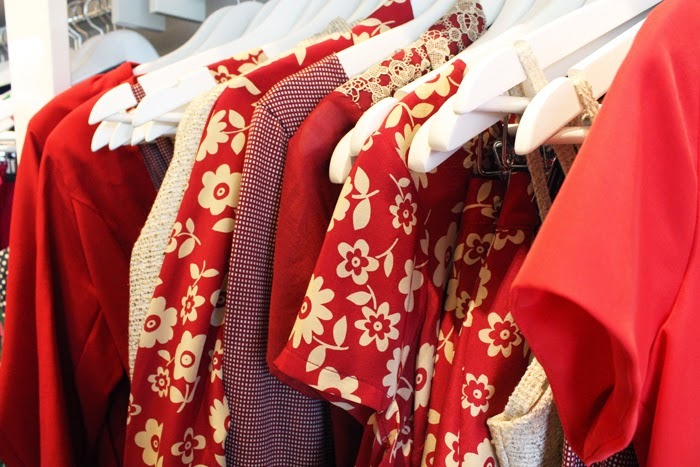 Lots of reds, a watercolour print, florals and plenty of Summery frocks to choose from. We're simply spoilt for choice! It was a fabulous night and it was great for me to catch up with Tara and Ellen, Britney who I have not seen in ages, Helena, Christine and to finally meet Steph. The lovely Evelyn from Just So Pretty was also on hand to share her experiences about fashion journalism which was very inspiring. I took my handy-dandy camera along with me and captured some of the night. These pictures really don't do the stunning collection justice though so if you live locally, head on in to Amber's boutique or have a browse online. Look at all that gorgeous red! I love the Primeira Dama printed pieces. These shorts in particular stand out. One of the highlights for us bloggers was being able to see Amber's designs up close and personal. 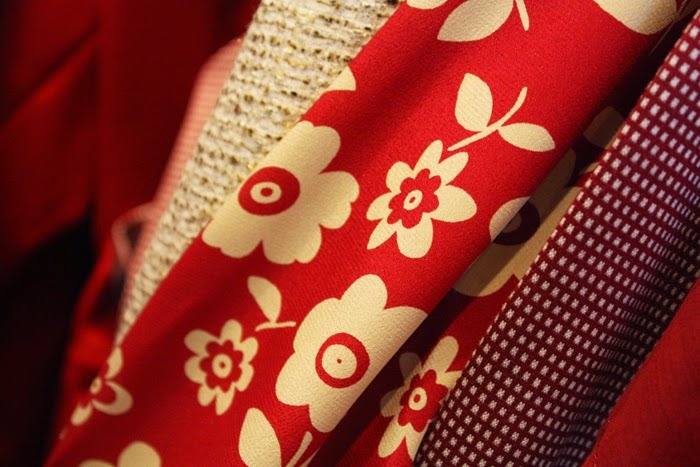 There was a lot of delight over the different textures and fabrics. Can you tell I really liked this floral print? I believe Amber bought this fabric back from her travels in America recently. 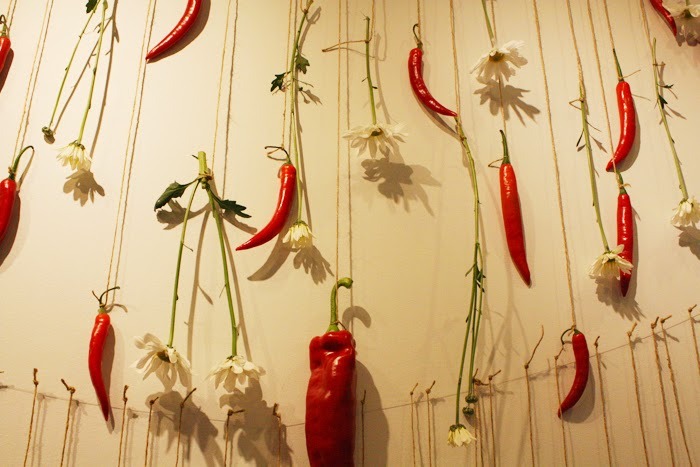 The feature wall based on the backdrop of the lookbook images for the Mrs Pinto collection. Chillis and flowers. This was again a popular feature with us bloggers. 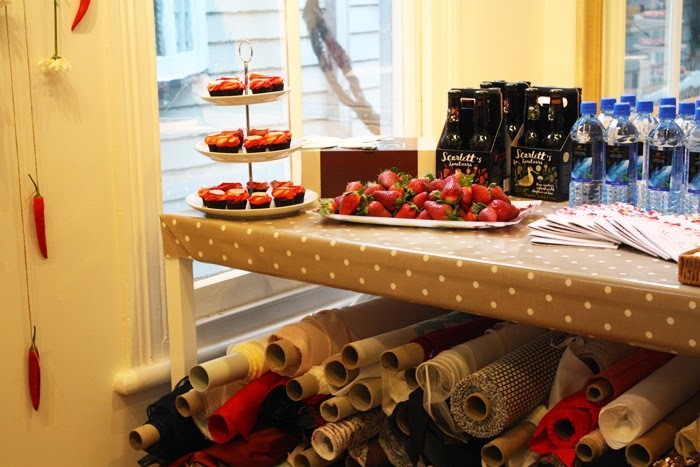 Delicious red Petal cupcakes, strawberries and Amber's fabric supplies. Those cupcakes were so good! I seem to have taken a lot of pictures of this rack of clothing! Perhaps it was the sparkles that kept drawing me back to it? Thanks so much for inviting me to check out the Mrs Pinto collection Amber! I love your work. PS-If you want to see a rather rad vlog check out this one from Britney. *What do you love from the Mrs Pinto collection?